Symphony Condominium is all a location that counts. As the name suggests, Symphony sits right next door to The Broward Center for the Performing Arts, and is the only condominium directly on the Fort Lauderdales beautiful river walk. Symphony is what downtown living is all about. Symphony Condominium, Fort Lauderdale was completed in 2006. Symphony Condo opened just after Hurricane Wilma hit the Ft Lauderdale area. It was an event that some say marked the downturn of the booming Fort Lauderdale Real Estate market. Based on Ft. Lauderdale Condos for Sale today, a standout, in value and luxury is Symphony Condominum. 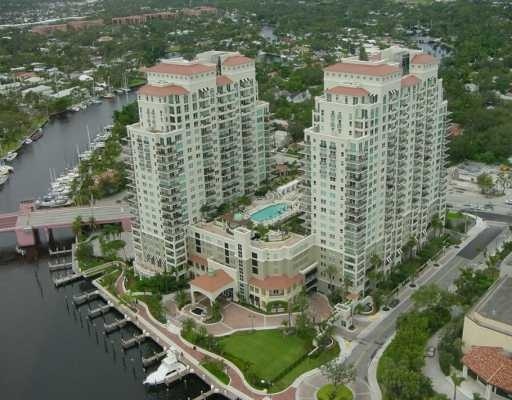 Symphony Condo Ft Lauderdale features one of the grandest condominium entrances in Fort Lauderdale Real estate sitting directly on the New River. The values that can be found at the Symphony Condo are certainly worth the attention of any Fort Lauderale Condo buyer. Las Olas Symphony Condo is a landmark in Fort Lauderdale Real Estate and make sure when you start your Fort Lauderdale Condo hunt to include a look at Symphony. From the moment you enter the gates and approach the waterfront valet area at the Symphony Condominium you know that you have entered one of the finest buildings amongst Fort Lauderdale Condos. Symphony Condominium has over 300 units divided into two towers surrounding a 7th floor pool deck, featuring a hottub and garden area. The ammenties at this Ft. Lauderdale Condo are unsurpassed, including but not limtied to the waterfront healthclub that is featured at Symphony Condominium. The Symphony Condo also feaures, numerous meeting and social rooms, a private screening room and thirteen docks on the New River. A boat lover can also purchase a dock along with their Ft Lauderdale Condominium, when available at The Symphony Condominium. At Eric Miller and Associates, we are here to help, with your next Symphony Condominium purchase or sale. Contact us directly at (954) 383-8170 for all your real estate needs at the Symphony Condominium.